This week's Altercation includes reviews of the Jazz at Lincoln Center Orchestra's tributes to music icons and the darkly comedic Broadway hit Hand To God. My new Nation column is called “Remembering the Left-Wing Terrorism of the 1970s” and it’s a discussion of Bryan Burrough’s book on that topic, Days of Rage. This is an audio interview I did with The Writer’s Voice about de Blasio, inequality and New York City and you can listen to it here. And here is an excerpt from Inequality and One City published by The National Memo. Your intrepid reporter was very much out and about this week. It began with the first in a series of Michael Feinstein-curated three-part series of American Songbook performances dedicated to the life and legacy of Frank Sinatra who was born 100 years ago this year. During the first of these three dedicated programs his guests were Ann Hampton Callaway, Lynn Roberts, and Nick Ziobro, all backed up by a seventeen piece big band. It was a pretty fun evening. It stuck, mostly, but not entirely to the early pre-Capitol-era Sinatra which was heavy with Cole Porter and other songs that were later reworked (and improved) over time. Feinstein is as much an educator as an entertainer and so one learned a great deal too. Lynn Roberts, who has been performing for seven decades, sang with Frank and the Dorsey band. Callaway did not sing with Frank, but sang in the small rooms in Vegas when he played the big rooms, and this 19-year-old Nick Ziobro really did put one in mind of the young man who broke hearts at the Paramount Theater. The question is whether you can enjoy “Sinatra” without Sinatra. You can for sure, and most everyone did, but the evening is haunted by “The Voice.” Frank’s great taste both in songs and arrangements—coupled with the great big band made for a pleasant, if not earthshattering evening. A few nights later, the Jazz at Lincoln Center Orchestra paid tribute saxophonist and clarinetist Joe Temperley who, together with only Wynton Marsalis, has been in the orchestra for the full 26 years. Temperley, who is 85, performed with the orchestras of Humphrey Lyttelton, Woody Herman, Thad Jones/Mel Lewis, Clark Terry, Joe Henderson and most significantly Duke Ellington. But instead of playing old chestnuts from those days—or at least exclusively old chestnuts—band members saluted him with original compositions and debut arrangements that gave him a chance to shine (Wynton wrote and arranged a five-movement concerto). Another big highlight was the closer—a piano and sax duet by Temperly and pianist Dan Nimmer on Ellington’s “The Single Petal of a Rose” from “The Queen’s Suite,” that left the audience breathless. Says Wynton of Temperly: “There is no greater sound on earth.” Well, I don’t know about that. But it sure was moving, and powerful and on occasion, beautiful. The Café Carlyle has brought back John Pizzarelli, following his recent run with his at-least-as-talented wife, Jessica Molaskey, this time as a team with the Brazilian singer-songwriter and pianist Daniel Jobim, grandson of the seminal Antonio Carlos Jobim for a show called “Strictly Bossa Nova II,” which I guess is a sequel to a previous show of which I was unaware. Which is too bad, because this show was terrific. Though so, apparently was the last one. Will Friedwald wrote of it: “Mr. Pizzarelli and his rhythm section . . . renew our faith in the Jobim classics as well as the idea of sambaing up the likes of George Gershwin and Cole Porter.” At one point, Pizzarelli termed an album off of which they did three songs, João Gilberto’s “Amoroso” to be the “musical equivalent of Viagra.” Well, okay, but I thought it was a great deal more romantic than just that. obim sang softly, in a near whisper and the band, Helio Alves on piano; Duduka DaFonseca on drums; and younger brother Martin Pizzarelli on upright bass demonstrated how much newness can be found in music you thought you knew—whether it was “Great American Songbook” style songs converted to bossa nova style (“‘S Wonderful,” “Change Partners,” or songs that began that way but received their reinterpretations and revisions from this gorgeous and sensitive ensemble. (The drumming was particularly revelatory.) And as weird as this is to say, I actually preferred their versions of the songs to those performed on the album Francis Albert Sinatra & Antonio Carlos Jobim against all apparent popular opinion, I find to be one of Frank’s least successful albums—especially his famous albums. Ticket prices are just as high as ever, but Pizzarelli is just as charming and talented as ever and this beautiful bossa nova show cannot help but leave a smile on your face. And if all you know about it is “The Girl from Ipanema,” you’ll come out knowing a lot more than when you went in. Hand to God on Broadway at the Booth Theatre. Hand to God, currently at the Booth Theatre, is a wonderful play about a gray sock puppet with fake fur, real teeth and a bad case of possession by Satan. It’s hard to describe how creative and original—also ridiculous—this play is. 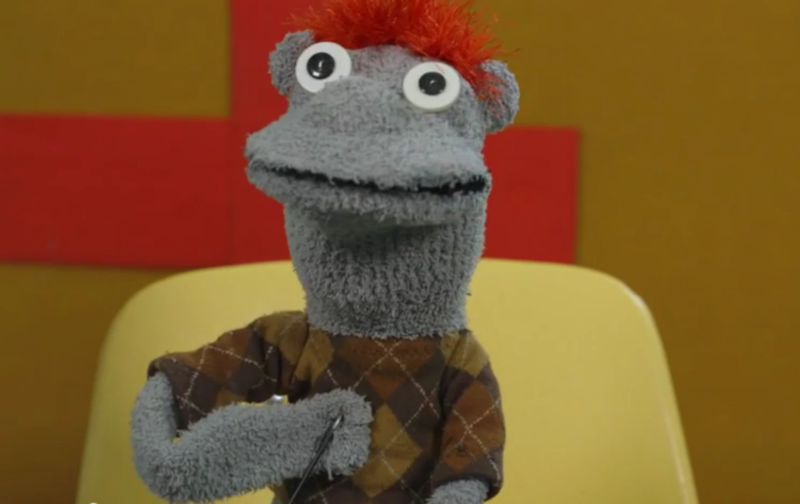 Have you ever wanted to see two puppets screwing for a really long time—especially since it was the boy-puppet’s first time—in pretty much every imaginable position, and lots of funny faces? I’m not sure what it’s really “about.” It takes place in a church basement during the meetings of a puppet-making class. The wonderful Sarah Stiles plays Jessica who is “really more into Balinese shadow puppetry,” but she will “take what [she] can get.” The puppet, Tyrone, is the best of the characters—and that is saying something, even though you can see Jason’s lips moving the whole time. And believe it or not, his hand gestures are the funniest part—that’s right a puppet’s hand gestures—along with his profane mouth. The play is being compared to “The Book of Mormon,” which I still haven’t seen, but people who have, tell me it’s not quite as funny as this one. My guess is that there is more to embarrass a dad who has taken his teenage daughter to it in “Hand to God” than in a play about Mormons, and there is also something to be learned for a sophisticated New York audience about the trials and tribulations of religious folk in the heartland who find their faith tested. Still, it’s mostly fun and lots of it. Great cast, too.